Try this 100% pure caffeine eye cream if you have puffy eyes and/or dark circles. The active ingredient, caffeine is very effective at reducing puffiness and helping to reduce the appearance of those dark circles that develop under the eyes. Caffeine also helps to reduce the appearance of fine lines that start to appear in the under eye area and at the corners of the eyes. If you are vegan or need to stay gluten-free, this product is good news for you as it scores 100% on both counts. As an addition to the pure caffeine in this eye cream which also has powerful antioxidant benefits, the cream is enriched with nourishing, natural blackcurrant oil. It contains no synthetic chemicals or chemical preservatives, no toxins or parabens and no artificial fragrance. It does contain a blend of antioxidant vitamins A and C as well as extracts from organic herbs Rosemary, Oregano, Thyme and Goldenseal as well as organic Grapefruit seed. The natural fragrance comes from the pure vanilla included in this rich cream. Whilst the manufacturers suggest you apply a generous layer to the orbital eye area either in the morning, or at night, my preference is to use this cream in the morning as caffeine has been proven to help protect skin from sun damage. In fact caffeine is now being added to some sunscreens and to skin care products containing antioxidants as the caffeine helps to make these products work better and for longer. There are no known adverse effects to using caffeine in products that are applied to the skin. The eye cream is quite thick to apply but fortunately, the dispenser dispenses a very fine line of cream so that it is easy to only use a tiny bit. Reviewers note how easy it is to apply and how well it is absorbed into the skin. Commenters also mentioned that you can definitely smell coffee in the product, some say it smells a little like cookies but most people said that they preferred this to having an artificial fragrance added to the cream. 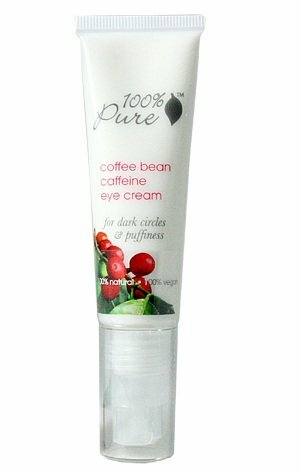 Overall verdict on 100% Pure Caffeine Eye Cream? Overall, this is a great moisturizer that will help to smooth your skin and provide an excellent base for eye makeup. Many happy customers report excellent improvements and even the ones who do not, all agree that this is a great eye cream for moisturising and protecting the eye area so, for the price, I would give this Pure Caffeine Eye Cream five stars too! What Causes Black Circles Under Eyes?